Marc P. Trent, and his father, Douglas P. Trent, established the Trent Law Firm P.C. (Trent Law Firm) earlier this year. The firm represents clients throughout the Greater Chicago Area, from DuPage County to Will County, and everywhere in-between. The Trents worked together at another law firm where Marc was an associate attorney and Douglas was a managing partner. The father and son team formed their own law firm when their former firm dissolved on December 31, 2017. “When I look back, I realize that my dad and my business experience were grooming me for this exact moment. I can’t wait to see how the future unfolds,” Marc Trent, one of the founding partners says. 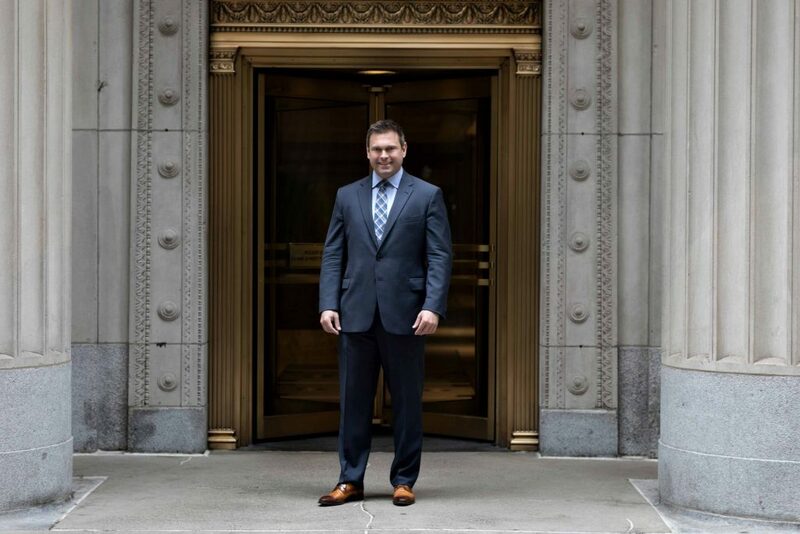 The results-driven, take no prisoners, legacy law firm primarily focuses on Employment Discrimination cases in the Federal District Court, Personal Injury and Workers’ Compensation cases, Employment Law, and Business Transactional and Litigation matters. Attorneys also litigate some Family Law cases for existing clients. General Douglas MacArthur, one of the best known American military leaders of World War II reminds us that, it is fatal to enter a war without the will to win it. “My dad is a former marine. He taught me to understand the mission, to take command of the situation, to build a flexible strategy, to see the big picture without losing sight of the details, to adapt as necessitated by the circumstances, and to be calm when faced by setbacks. As a result, I have learned not to be afraid of confronting larger or more well financed opponents,” Marc explains. The founding partners have earned a reputation for their willingness to step into the breach. This includes bringing employers that violate employment laws to justice. Specific areas of expertise include Wrongful Termination, Retaliatory Discharge, Employment Discrimination and Harassment, Sexual Harassment, Wage and Hour Law Disputes, Workplace Violence, and Violations of Federal and Illinois Whistleblower Laws. Trent Law Firm has a portfolio of cases that demonstrate the founding partners’ will to win. “We pride ourselves on getting good results, not just on doing our job. We put in the time and the effort that it takes to win. We work harder and smarter than our opponents. Many of our clients have been intimidated and disarmed by bigger and better financed opponents or let down by government agencies that are supposed to protect them. My dad and I really want to get some justice for them. And, because we work on a contingency basis, we don’t get paid unless we win which means we are very motivated to get to a positive outcome,” Marc adds. Examples of successful judgments include Joanna Ciesielski vs. Hooters. In this instance, the 21-year-old Hooters waitress had endured several years of sexual harassment and inappropriate touching and rightly believed that the peepholes in her dressing/break room wall invaded her privacy. Douglas Trent acted for the plaintiff and won the Ciesielski case in a 7-day jury trial. In another case, Marc won a difficult discrimination case against his client’s employer, one of the world’s largest food retailers. Marc was undeterred by his adversary’s high priced corporate legal team and won one of the first cases the 7th District Court heard on discrimination based on sexual orientation. “My father and I have different perspectives and experiences. We have a joint office strategy and work as a team to develop case strategy and approach,” Marc says. The firm’s corporate litigation attorneys have been resolving complicated corporate conflicts for over 40 years and can ably assist with a wide variety of corporate matters. Areas of expertise include Partnership Disputes, Contract Performance, Shareholder Litigation, Tortious Interference and Corporate Creditor Work, and a variety of other business-related legal services including Business Transactional/Litigation matters, Commercial Transactions, and Corporate Litigation. Moreover, the business-oriented firm can introduce clients to various government programs that encourage growth. Prior to his legal career, Marc owned a company that imported and exported medium and heavy-duty truck parts and remanufactured engines in Colombia, South America. Prior to selling the business, he enjoyed senior management roles at Capitas Financial Inc. and FSG, LLP where he counseled financial advisors on a number of different financial structures. Clients included Wells Fargo, Wintrust and the Royal Bank of Canada. Marc is fully experienced in business management, international business and markets, foreign banking and currency, international and domestic employment matters, corporate governance, trade agreements, importing and exporting, and contract negotiation. Marc has his Bachelors, Masters in Business Administration, and Juris Doctor. Douglas P. Trent has practiced law for the totality of his professional career. He graduated from Lewis University with a Bachelor of Science and Illinois Institute of Technology / Chicago Kent College of Law with a Juris Doctor. Areas of concentration include Family Law, Commercial Litigation and Transactions, and Injury Law including Personal Injury, Wrongful Death, Workers’ Compensation, and Medical Malpractice. Trent Sr. is a member of the DuPage County Bar Association, the Illinois State Bar Association, and the Illinois Trial Lawyers Association and has served on the Board of Trustees, Village of Bloomingdale and is past president of the Justinian Society of Lawyers, DuPage County Chapter. Marc loves dogs and contributes to the American Society for the Prevention of Cruelty to Animals (https://www.aspca.org/). His two dogs are Simba, a Japanese Shiba, and Little Bear, a German Spitz. “Simba has always had a part of his ear chewed off. That’s how I found him. I relate to his injury on a visceral level. There are too many times to count that opposing counsel has tried to take a bite out of me. They haven’t succeeded. Like Simba, I’m still standing,” Marc concludes with a smile.